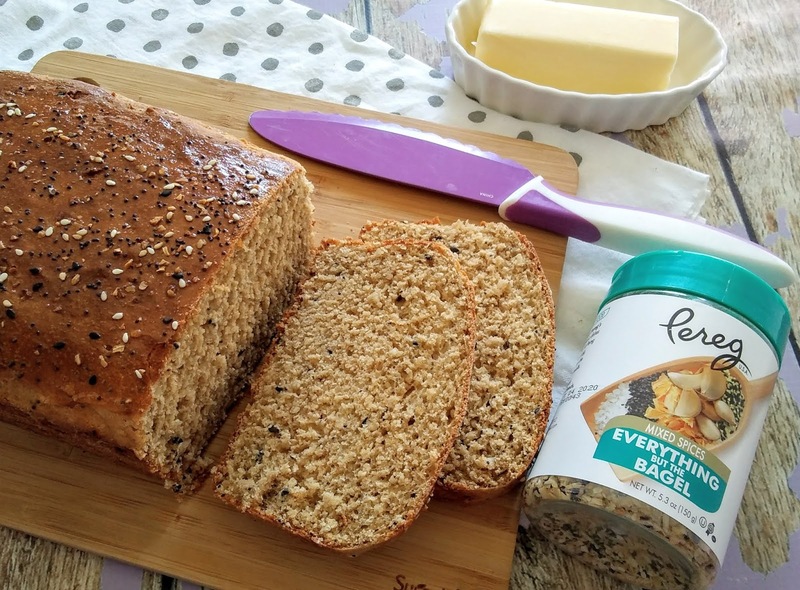 I love all the protein, seeds, and spices in this wheat bread. 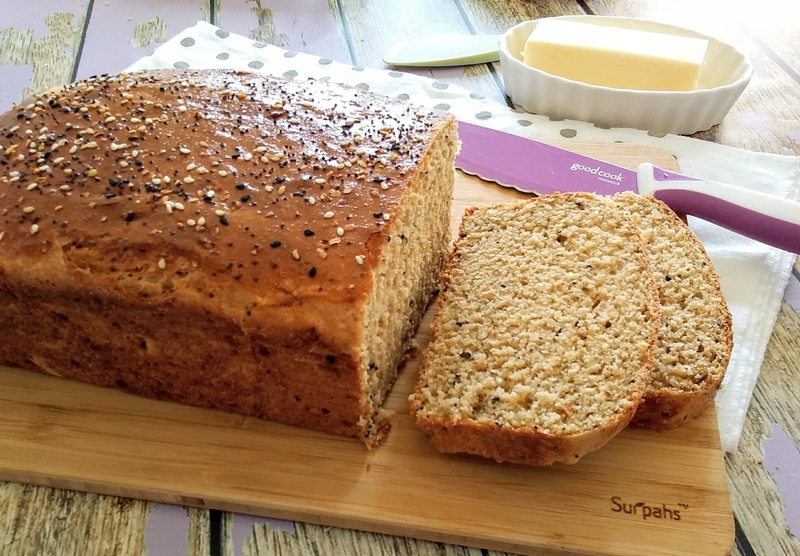 I am not usually a bread person but when I do enjoy bread, it has to be homemade and loaded with seeds. Once in a while, I will buy bread at the store if I am craving bread but the kind that I like is very expensive, like $6.00 a loaf. This bread that I enjoy from the store is good because it has protein in it. I like the extra protein in my bread as I don't eat meat and I am trying to strengthen my muscles. So since I do not want to pay $6.00 for a loaf of bread, I decided to make it at home. I have made bread plenty of times but this is the first time that I am experimenting with adding protein powder to my bread. 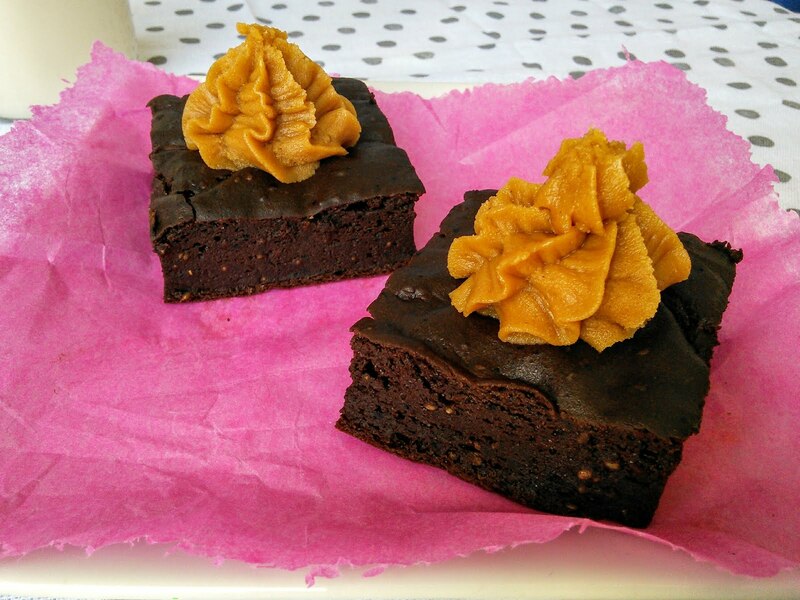 I have used protein powder in many other recipes like vegan chocolate pancakes but never in a bread recipe that uses yeast. So I am not sure how the protein powder will affect the rising of the bread. 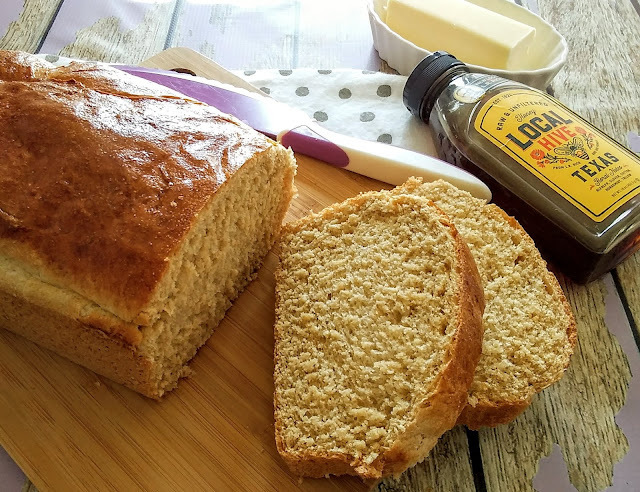 I made the boys Honey Whole Wheat Bread last week so I decided to make a loaf of bread that I would enjoy. When I make bread, I love adding lots of flavor and seeds to it. 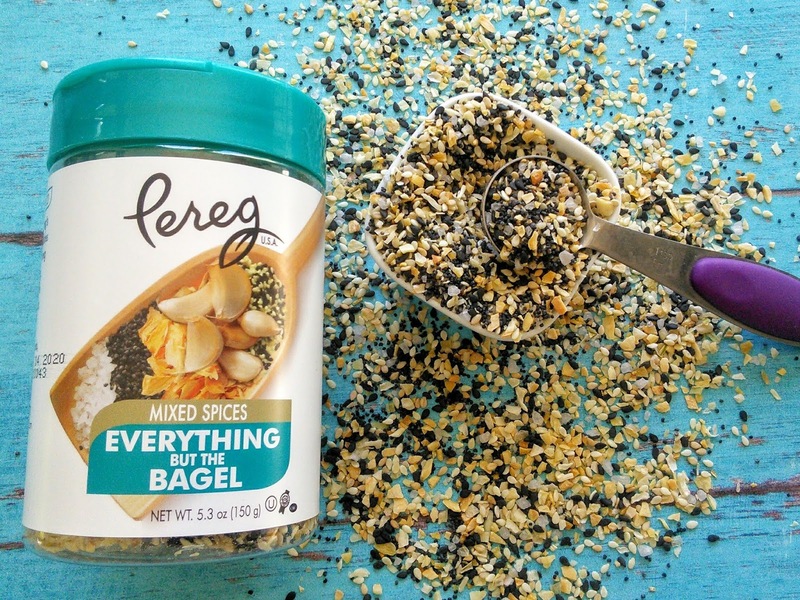 So I decided to see how an Everything But The Bagel Spice blend would taste. I love this spice blend on bagels and eggs. It is also great on avocados. It really is an amazing spice blend. I like that all my favorite spices are all in an easy to use shaker container. This bread is amazing and has great taste. The protein powder gave the bread an amazing shape and texture. 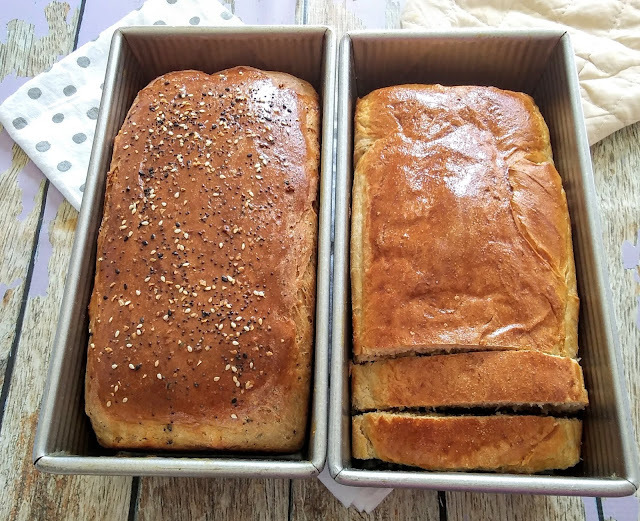 I made this bread along with a honey wheat bread on the same day and followed the same recipe, except for adding the protein powder and everything spice. This one rose so much more. The salt and garlic in the bread also give great texture too. I love eating this high protein bread with over easy eggs and a sliced avocado. I just place the eggs and avocado on top of a slice of bread and it is so delicious. I sometimes sprinkle more Everything Spice on top of the eggs! This bread also makes amazing sandwiches too. 1. To make the bread in a bread machine: put all the ingredients bread pan in the order listed, except the egg yolk. Program the bread machine for dough and press start, as you only want the machine to do the mixing and rising. The bread will be baked in the oven. Skip to step # 4 when the bread is done rising. 2. To make bread by hand: Mix all of the ingredients in a large bowl, or in the bowl of a stand mixer, except the egg yolk. If your dough is too dry add more water 1 tablespoon at a time. 3. Knead the dough until it's smooth and just slightly tacky, about 8 to 10 minutes. Place the dough in a greased bowl, cover with a clean towel or plastic wrap, and let it rise until doubled in volume in a warm spot, about 1 to 1 1/2 hours. 4. 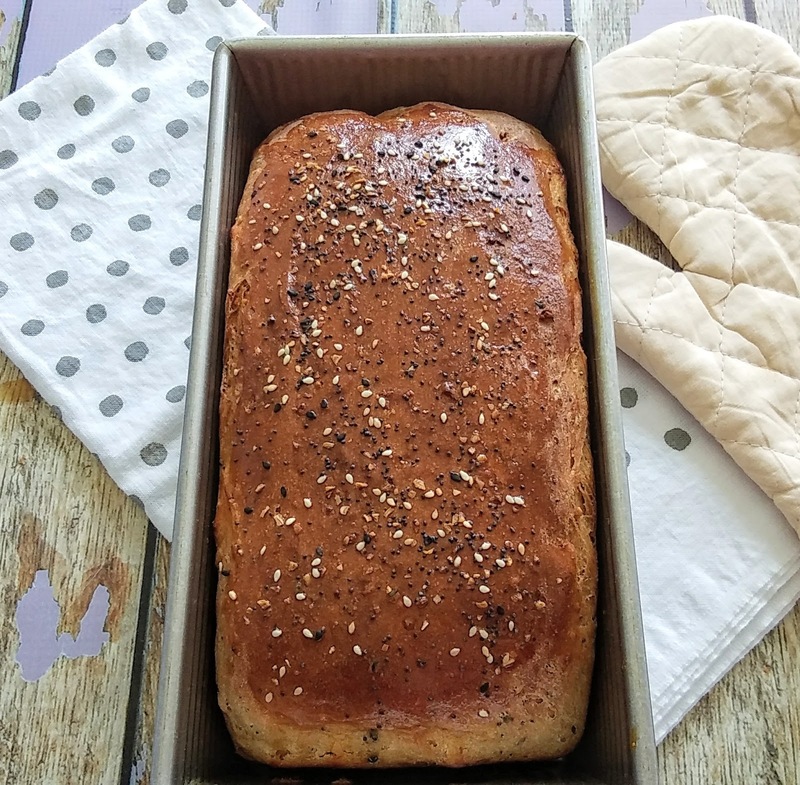 Once your bread is done rising, gently deflate the dough and shape it to fit a greased 8 1/2" x 4 1/2" loaf pan. Let it rise, covered, until doubled, about 1 to 1 1/2 hours. Beat the egg yolk and brush on top of the bread dough. Sprinkle additional Everything Spice blend on top before baking. 5. Bake the bread in a preheated 375°F oven for 35 minutes, or until a digital thermometer inserted in the center of the loaf reads 190°F. Remove the bread from the oven, remove it from the pan, and cool it on a rack.